The Moto G5 Plus 64GB, Moto x4, LG X Charge, and LG Q6 are now on sale. As expected, the Prime Exclusive LG G6+ is now on sale. The Nokia 6 is now $149.99 until December 24, a $30 reduction from the usual price, and $80 cheaper than the non-Prime model. That's not bad at all for a Snapdragon 430 phone with 3GB of RAM, 32GB of expandable storage, and a 5.5" 1080p screen. Nokia says the phone will be updated to Android 8.0 Oreo sometime soon. A few more deals will start on December 10, and last until December 23. The Moto G5 Plus 64GB will be $199.99 ($40 off), the Moto x4 will be $279.99 ($50 off), the LG X Charge will be $199.99 ($30 off), and the LG Q6 will be $179.99 ($50 off). Finally, the LG G6+ will be $449.99 ($50 off) from December 17-23. 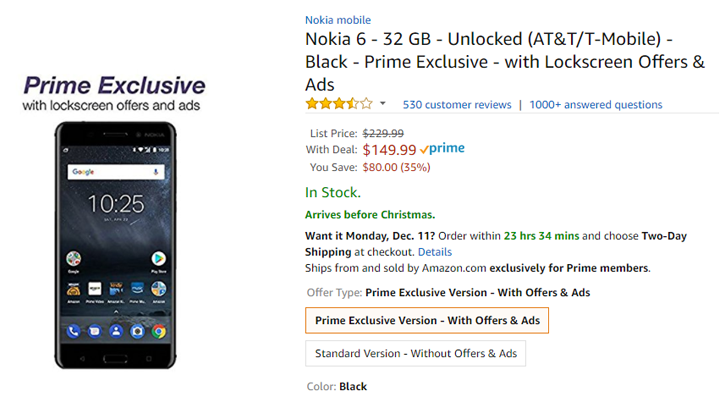 These are some pretty great deals, especially the Nokia 6, but you'll have to decide if the Amazon advertisements are worth the steep discounts. Let us know if you plan on buying one in the comments below.